Welcome to the internet home of the Orland Historical Society . 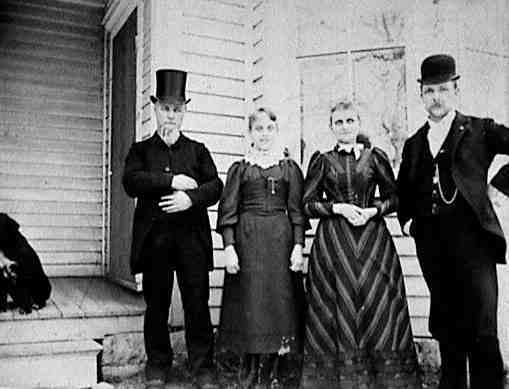 You will find information about the Orland Historical Society as well as pictures and exhibits from Orland’s history. Please browse the entire site – we think you will find it to be of interest – and visit often as we will be updating the exhibits several times a year. The Humphrey House conducts tours on the second Sunday of every month. Please don’t miss this exciting tour of Orland Park history. The House is located on the corner of Beacon Ave. and 144th Place. The Orland Historical Society was formed in 1976 during the American Bicentennial to appreciate Orland’s historical heritage and to preserve it for future generations. 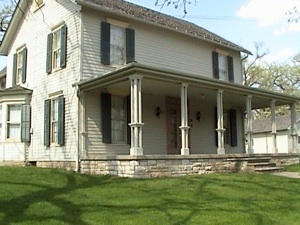 The Orland Historical Society headquarters is at the John Humphrey House Historical Site located at 9830 West 144th Place, Orland Park, Illinois. The John Humphrey House is open to the public on the second Sunday of each month from 2PM to 4PM. Admission is free. More information on the John Humphrey House, which is pictured above, can be found in the John Humphrey House Exhibit. Another historic site maintained by the Orland Historical Society is The Hostert Log Cabin Site located on West Avenue, near 147th Street, Orland Park, Illinois. Two log cabins stand in a wooded setting , one originally built in 1850 by Jacob Hostert a few miles west of Orland Park on 143rd Street. The second log cabin is a reconstructed cabin originally built in 1855 by Bernard Hostert, Jacob’s brother, on 159th Street west of Will-Cook Road. The Jacob Hostert Log Cabin is furnished with authentic period pieces dating from before 1860. The Bernard Hostert Log Cabin contains old farm implements and tools, and a collection of hand irons. For more information, please call us at 708-349-0065 or e-mail us at BOB1773@aol.com. If you are interested in being a member of the Orland Historical Society, please fill out our membership form and enclose a check to the Orland Historical Society and send it to us at P.O. 324, Orland Park, IL 60462.